Alternative Name:: ブトゥーム; 惊爆游戏; Btoom! 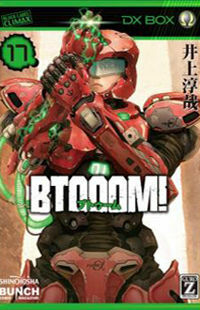 Sinopsis : From Yen Press: Ryota Sakamoto is one of the top-ranked players of BTOOOM!, an online battle game. But no amount of simulated warfare could have propared him for what is to come …Ryota wakes one evening to find himself dangling from a tree by a parachute with no recollection of how he got there. Before he can orient himself to his unfamiliar surroundings, Ryota is attacked. As a barrage of explosives rain down on him, Ryota realizes that he too has a pack of bombs …bombs that look very similar to the ones used in BTOOOM! Ryota may have mastered the online game, but can he come out on top in this real-life game of survival?! June 10, 2015 in BTOOOM!